An SUV's owner received a ticket for street cleaning even though the car's tires had been stolen overnight. CHICAGO (WLS) -- An SUV whose tires were stolen overnight in Lincoln Park was ticketed Wednesday morning for street cleaning. 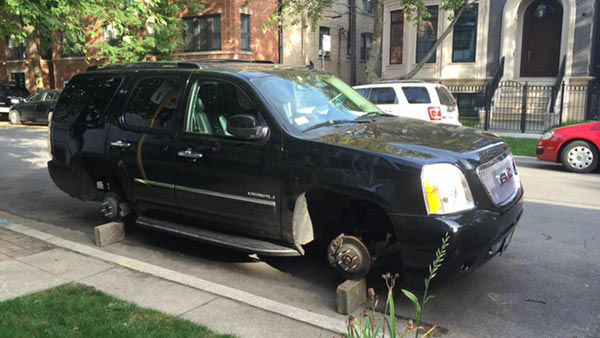 Chicago police say they received a call around 7 a.m. Thursday to report all four tires having been stolen. The owner said he parked his car around 10:40 p.m. and discovered his vehicle resting on bricks in the morning. Police are investigating, but no one is in custody. The owner left a note on his dashboard referencing his police report number so parking enforcement aides could see why he was unable to move his car for street cleaning. He received a ticket anyway. Late Thursday, the city said the ticket will be voided due to the circumstances of the issue and the knowledge that the tires were stolen overnight.